I was thrilled to find out that a good friend of ours, half of the former Sneaker Club DJs duo, Ant Douglas, was changing direction and moving into fashion. A guy who oozes style, class and coolness, I knew from the start that this was going to result in gorgeous, wearable and trendy items from a brand which has a lot of meaning behind it. Branded as ‘Sneaker Club Clothing’, still maintaining the identity behind the original beginnings, it was founded ‘on the grounds of art through music’ and ‘passion for footwear…With humble beginnings, Sneaker Club has emerged not only as another clothing label but a lifestyle – designed to capture the imagination of creatives’. It is these foundations which I’m certain will set Ant’s new venture in good stead for its launch on 11th November. Well, music has, is and always will be a passion of mine. It’s crazy because ventures that have come and gone have been inspired by music in one way or another. I will say though that I haven’t decided to change direction at all, you could say it’s a case of going with the flow. I never did plan to start designing clothes for others to wear, it was more that I was sick and tired of wearing the same old same especially when out playing gigs. When me and my former partner in crime formed Sneaker Club (DJs) – we decided that I would design us some tops to coincide with our alias and help us stick out from the hundreds and thousands of DJs and quickly a small move turned us from a couple of DJs to a small brand. How has your background in music influenced your designs? I can’t say that the clothes are inspired by my background in music as such, they’re more about a personal statement. I am a lover of all things creative and love various forms of art from skating, biking, graffiti, anything music based, free running etc., the list goes on and eventually I’ll be incorporating them into the clothing. I don’t know how, but I will. Look at it like this… this is a label that started out as a personal statement, born through music and a love of sneakers. It’s that simple. What sets Sneaker Club Clothing apart from other fashion brands out there, whether big or small; what’s unique about it? The fact that it’s called Sneaker Club for a start I hope. Haha. No, for me, looking at other brands is important and from what I’ve seen, there is a pattern that has formed with most of them that I try to avoid. Sometimes I think the bigger more obvious thing clouds vision and doesn’t leave much space for the smaller more personal touch. That’s not what we’re about. Without giving too much away, with us, it doesn’t stop at printing a measly design on a pre manufactured item, its about how we can finish the item off creatively and originally. What items of clothing can we expect from the label? Can you give us a few cheeky hints? 2013 is about our introductory original and limited items. 2014 will take us into cut and sewn ranges plus a few more surprises along the way. I will stop now. No more cheekiness from me. Just wait and see. In an ideal world, where would you like to see SCC heading, any visions for the brand or is it a case of see where the brand takes you? What is ideal? I would just hope it’s heading in the direction I would like it to. I don’t have a vision to take over leading brands or swipe their audience. I just want to have my own input and be able to carry on wearing my own clothes and if people are happy to come along for the ride, I’ll happily welcome them on board and see where the ride takes us. “Sneaker Club has evolved through my lifestyle and that’s exactly what I intended on creating – a lifestyle brand not just about the music or the clothing in particular but just a lifestyle”. Finally, if you could have anyone to be the face of the brand, who would it be? Probably the most conventionally unattractive person. Someone who isn’t faceless and has the slightest bit of substance. Haha. Taking applications now. 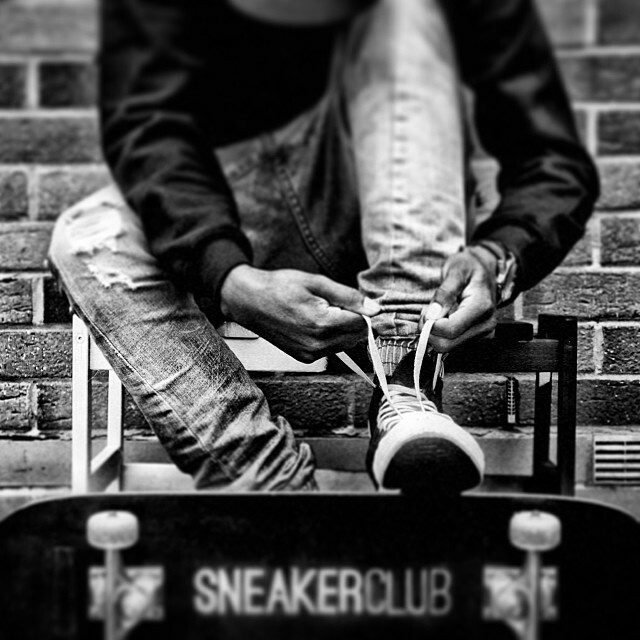 Check out Sneaker Club Clothing online / Twitter @SneakerClubUK / Facebook / Instagram @SneakerClubLabel. PERK!ER Rocky Road & Tiffin Bites: Perking up gluten-free eating!